Alicja Bialecka is a museum curator and Representative for the New Main Exhibition at the Auschwitz-Birkenau State Museum. Between 2006-2012 before becoming museum curator, Ms. Bialecka was Head of Educational Programs at the International Center for Education about Auschwitz and the Holocaust (ICEAH). She also served as Polish delegate to the Museum and Memorial Working Group of the International Holocaust Remembrance Alliance (IHRA). 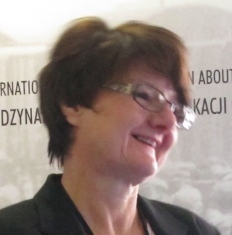 Bialecka is co-author of the educational mission and methodological concept of the ICEAH, as well as of the IHRA guidelines for youth trips to memorial sites. Her works include published articles and on educational dimensions of memorial sites in the context of European identity. As a researcher, she specializes in the anthropology of memory at Auschwitz and problems of its representation in literature and museum narratives. As a former schoolteacher and currently a museum curator at the Auschwitz-Birkenau Memorial, I feel obliged to share my knowledge, experience and commitment with those whose jobs or diplomatic positions might influence the course of political or military actions and stop possible genocidal conflicts. Apart from academic and educational programs on genocide and mass atrocity prevention that are directed towards all possible national, social, ethnic and religious groups, there should be political initiatives to strengthen international cooperation in this respect. Auschwitz is a distinguishable, clearly recognizable warning sign that conveys universal truth about the nature of humanity and its behavior in extreme situations. For the entire contemporary world, it is a clearly defined icon that carries a universal and symbolic message.